Jeddah, Saudi Arabia; May 4, 2009: Emaar Residences at the Fairmont Makkah, the fully-furnished serviced residences within the tallest tower in the Holy City of Makkah, will be managed by the luxury global hospitality operator Fairmont Hotels & Resorts. The Emaar Residences at the Fairmont Makkah are located directly on the Haram Plaza and residents have breathtaking views of the Holy Ka’bah, Haram or city of Makkah from their rooms. Ideal for pilgrims and families who desire to own a home in the Holy City, the spacious residences, ranging up to 160 sq m in size, will be elegantly furnished, featuring designs that reflect the Islamic heritage. Most residences will offer a kitchen, living area, dining area, built-in wardrobe and bathroom to complement the spacious bedrooms. Emaar Residences at the Fairmont Makkah includes spacious studios and one- to three-bedroom residences, which are offered on a leasehold basis. Residents can also opt for a rental programme with Fairmont, allowing them to leverage the global sales and marketing reach of the luxury brand. 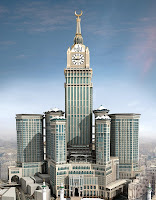 The Makkah Clock Royal Tower, a Fairmont Hotel, which houses the Emaar Residences at the Fairmont Makkah, is part of Abraj Al Bait, comprising seven elegant towers and part of the King AbdulAziz Endowment of The Two Holy Mosques. At 577 metres, the architectural landmark, developed by Saudi Bin Laden Group will be among the world’s tallest hotel towers and will feature dining outlets and elegant conference and banquet facilities. Distinctive features include a 40-meter clock more than five times larger than London’s Big Ben announcing daily prayer timings, as well as a Lunar Observation Centre and Islamic Museum to showcase the region’s heritage for future generations. Fairmont will provide its exceptional brand of housekeeping, maintenance, concierge, bell, valet, security and owner's services to residents, who will have access to the Owner’s Club featuring a relaxing lounge area and business centre. Residents will also receive Fairmont Residential Ownership Benefits that include an exclusive array of privileges at every Fairmont hotel and resort destination. Fairmont Hotels & Resorts is a collection of luxury hotels that truly reflects the essence of their destination. Guests can anticipate an authentic reflection of each destination’s energy, culture and spirit, as is highlighted at the Makkah Clock Royal Tower, a Fairmont Hotel. Emaar has announced several key development initiatives in Saudi Arabia. Emaar, The Economic City, a Tadawul-listed company, is developing the King Abdullah Economic City, the single largest private sector development in the Kingdom on the Red Sea coast. Emaar Middle East has also launched Jeddah Gate, a master-planned community in Jeddah; and Al Khobar Lakes, a multi-billion dollar luxury waterfront development in the Eastern Province.